…along with about 900 other admirers of the Project Runway mentor, NYT Best Seller author, Emmy Award winner and longtime Parsons educator and administrator. Gunn spoke at the University of Rhode Island last night to an enthusiastic gathering of fashion fans who I suspect had high expectations that were exceeded beyond measure. Tim Gunn Golden Rule #1: Take the high road. This he says is passed down from his mother. Gunn concedes he has never sent a scathing email or left a raging email that he didn’t regret later. Take the high road and in the end, he says, it will serve you well. Unless the high road is so high it gives you a nosebleed, then get off he adds. 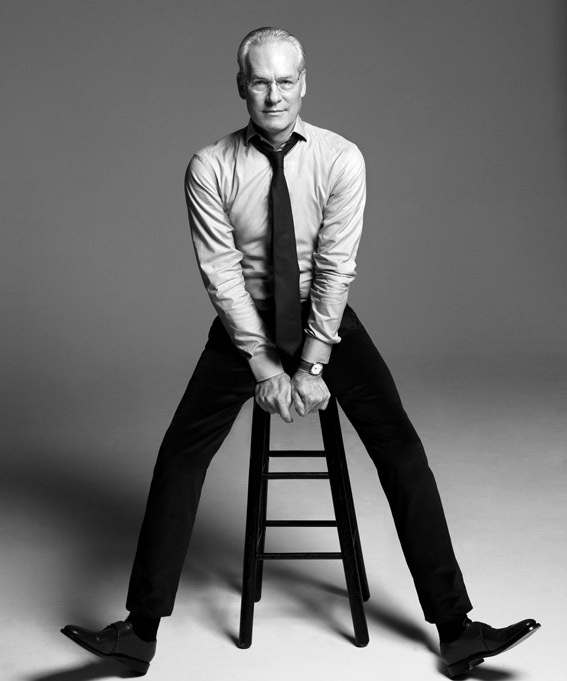 Tim Gunn Golden Rule #2: The universe owes you nothing. You are responsible for your own success and fate. Just showing up is not enough. Gunn says he’s been in the fashion industry for more than a decade and is endlessly surprised by the sense of entitlement shown by designers, media and more. Most fashion designers hate each other. Tim Gunn will not judge you by what you wear, but what you wear does send a message to the world on how you want to be perceived, which is why most of the time you’ll find him in a well-tailored suit. Wear what you want, he says, but know you have to take responsibility for it.”I have a very Socratic approach to fashion; I have a Socratic approach to most things,” he explained. He does not believe in fashion interventions. Instead, Gunn says men and women need to dress for the body we are. He says most Americans, in general, are wearing clothing that is too big for them. The key to getting fashion right, he declared, is: silhouette, proportion and balance. Focus on all three in your daily dressing and “you will own the world!” he declared.